Summary: Jack believes in buying high quality tools. Here are some of his favorites. Some of the authors at EETimes have been writing about tools of the non-EE kind they like. I've always had a thing with tools, and over the years I've reviewed lots of firmware and hardware engineering devices, from IDEs to scopes. But here are a few of the more traditional tools that I find really useful. Half a century ago my Dad gave me an old aluminum-case Craftsman drill. It was old when I got it, yet despite awful abuse it lasted for many years. Alas, that brand has not stood the test of time. Since then I've gone through many other drills. Some burned up. Others wore out. I still have a few corded drills (one on the boat, one in my home shop, a rarely-used but occasionally crucial 90 degree angle drill, and a hammer drill) but now the cordless versions are my go-to tools. Early versions were awful with too little power and short life between charges. My current favorite is a Makita XFD01 I've had for about 6 or 7 years. It's an 18 V Li-ion model that seems to run forever before the battery drains, and it has an enormous amount of power. Better: it came with two batteries and a charger that only takes 20 minutes. The one downside is the cost of batteries, which run a ridiculous $70 each. Three have failed over the years; two of those last week just last week. Turns out Home Depot sells the entire kit - drill, charger and battery pair - for $120, less than the cost a pair of cells. It seems most Li-ion tool batteries are very expensive. We have a Black & Decker weed whacker that holds a charge for only ten or twenty minutes of use. A spare battery is $89. Yikes! I used to use the Makita to drive screws. The basement flooded last year and in a fit of over-engineering I decided to put in a DriCore floor, where the wood is suspended above the cement by corrugated plastic. That meant driving a lot of Tap-cons. 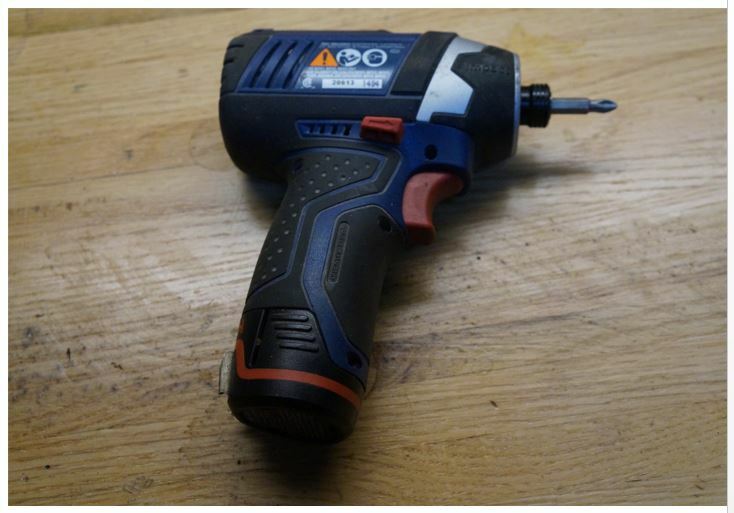 A friend recommended the Bosch PS41 12 volt impact driver, which is small, fits the hand perfectly, and is quite lightweight. It, too, came with a pair of batteries, but a single charge keeps it going and going. Having one bit in the Makita to drill the pilot hole, another in the hammer drill to break into the concrete, and a Philips driver in the Bosch greatly sped up the flooring project. 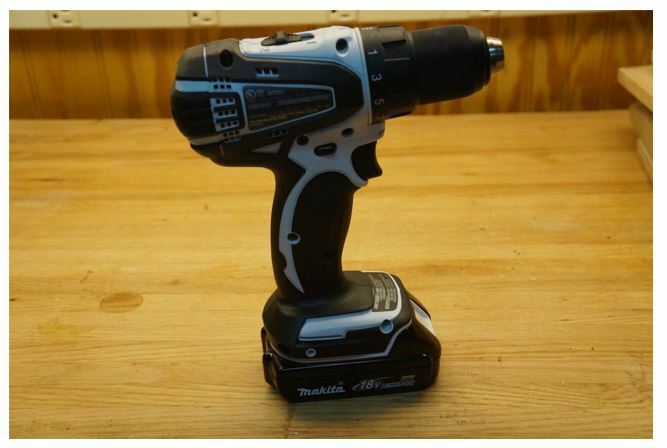 Today I use the impact driver nearly daily on other projects in the shop. With a small adapter it will even drive sockets, though not with the oomph one gets from a socket wrench. I do wish it could store one bit. 90% of the time I'm driving Philips screws, but those occasional flat heads need a different bit. You'd think something as old as the trusty combination wrench would have been perfected in the Dark Ages, but about a decade ago I discovered ratcheting wrenches at Sears. I have two sets now: one like those in the picture, and another where the box-end swivels up and down. 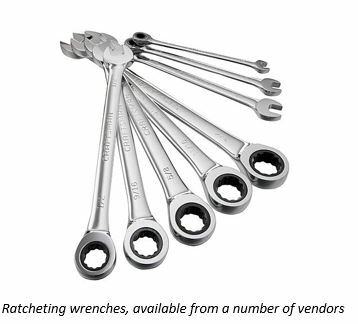 While these don't replace traditional wrenches (as they are slightly bulkier and won't go into a tightly-constrained space) they are a huge time-saver. The fellow who designed our sailboat back in the 70s also designed the Pride of Baltimore, but he must have been a madman. The engine is easy to work on if you weigh 20 pounds and are two feet tall. Working in the blind on some barely-accessible bolt makes me glad to have the wrenches. I bought a set for my son for Christmas. He informed me I had given him the same tools the year before! When looking for our current house I had promised Marybeth we'd have a tub. Yet the place we finally bought didn't have one, so we did a major rebuild making one large bathroom from two small ones. She now has the tub and I get brownie points every time she uses it. Knowing there were a number of other projects looming I bought a Porter Cable FR350A nail gun for the project. Swinging a hammer hour after hour is harder now than 30, 20 or even ten years ago, and the air-powered nail gun, while heavy, sure is a muscle-saver. Besides, it's just plain fun to shoot nails, and I admit to disabling the safety with a friend and banging off a few nails in the back yard. Since then it has seen use on a number of jobs. It's a little finicky, requiring adjustment occasionally so it sets nails at the proper depth. The tool stops firing when there are three or four nails left, but slip in another bandolier behind them and every nail gets used. The nail gun mostly goes unused, pulled out only when there's serious construction going on. 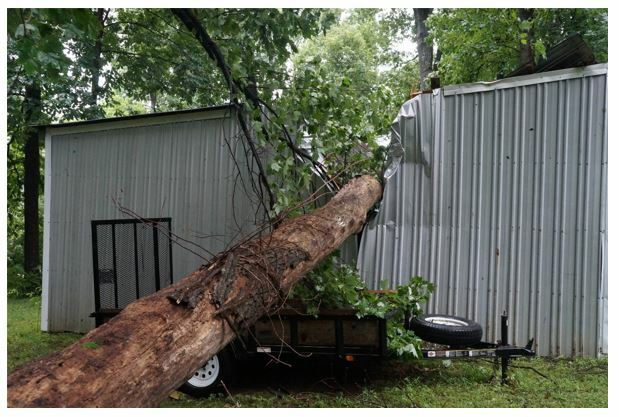 But last week a furious thunderstorm plopped a neighbor's tree onto our barn. We've decided to pull the building down and build anew, so the tool will be getting a lot of use. 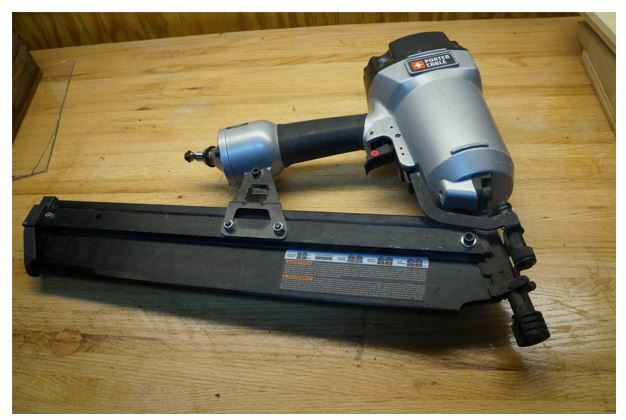 I'd like to get a similar screw gun, one that takes a bandolier of fasteners, but have not found such a product. A friend demonstrated one for setting drywall screws, but it was far less convenient as a nail gun. The poor barn! The damage inside was extensive. I hate hiring workmen. Some perverted gene drives me to think that if I own something, I should be able to take care of it. Occasionally that fails. We had some very large dead trees I was determined to take down but The Boss prohibited it. Watching the pros do the deed was humbling as they have a large bag of tricks garnered from years of experience. But when we do start a major project I use it as an opportunity to buy pretty much any tool that will aid the effort. The overall cost is much lower than using contractors, and the tools always prove useful on a future bit of work. I rarely buy cheap tools as they nearly always disappoint. One exception is a Poulan 4218 chain saw, an inexpensive Home Depot purchase that I rationalized would be OK because I'd rarely use the thing. A few years later we moved to a house in the woods, which we heat with five or six cords a year. And I bought a small sawmill. Many weekends the neighbors have to suffer through the whine of my saw. The pros laugh at Poulans, calling them "pull-ons" due to their hard-to-start reputation. Mine has been incredibly reliable (though, like for most small engines, ethanol in gas is always a headache). It's terrible at ripping and is not powerful enough or big enough for a lot of the logs I process now, so a Stihl MS362 got added to the line-up. The Stihl is a phenomenal - and expensive - machine. But once in a while, like when it vapor-locked this weekend, the Poulan comes out and proves its worth. Alas, over the decades most of the cheap stuff has been exactly that: cheap sometimes to the point of ticking me off. Another philosophical point about tools: I always get extras. Extra bits, blades, whatever might get consumed or need sharpening. I have a half dozen chains for each of the saws, because it's far faster to swap one than break out the file. At night, after a day using the tools, sometimes with an adult beverage at hand, I'll sharpen everything so the tools are ready for the next day. With plenty of spares on hand there's never a panic to replace a chain or other consumable that wears out. I keep an eye out for sales and replenish at a discount. What about your collection? What are your favorite tools?